Windows 8 needs touch to really shine. It's designed to give you the power of a PC with the convenience of a tablet, so you need to be able to drag apps side by side and swipe through web pages with your finger - and then you need to have a keyboard and trackpad for desktop applications. Making that work needs the right hardware, but Microsoft isn't the one to have the only credible Windows 8 tablet on the market. 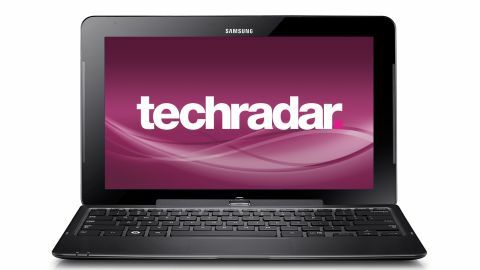 Samsung certainly has experience in the tablet market, and not just with the Galaxy Tab 10.1. The Samsung Series 7 Slate PC was the best Windows 7 tablet we tried, and Microsoft handed custom versions out to developers to encourage them to build apps for Windows 8. The main drawbacks were the lack of anywhere to put the pen and having to carry around both a dock and a Bluetooth keyboard, making it impossible to use like a notebook on your lap, on a plane or anywhere except at a desk. The Samsung Ativ Smart PC Pro deals with both problems and abandons the square-edged slab design for a more curved style that's also more comfortable to hold. Like the Microsoft Surface Pro, the Samsung Ativ Smart PC Pro is a true convertible; an Intel Core i5 tablet you snap a keyboard onto to turn it into something close to an Ultrabook. This is a very different and in many ways more conventional approach to the Windows 8 tablet-laptop hybrid, with an isolated keyboard that acts like a hinge. Is it a better solution than Microsoft's bolder design? As always, that depends on what you need to do. It doesn't have the striking yet subtle design of the Surface Pro. As a tablet it's slightly thicker and heavier, and the back of the screen is peppered with the vents and labels that normally hide inside and underneath a notebook. But the hinged keyboard means you can adjust the screen angle and comfortably use it on your lap (the kickstand on the Surface Pro works best for those with longer legs). And while the pen is small and not as well designed as the Surface Pro pen, it does work well for writing and drawing on the screen - and it snaps securely into a slot behind the screen so you won't worry about losing it. It's far more powerful than Atom-based Windows 8 tablets such as the Lenovo ThinkPad Tablet 2, HP Envy x2 - or the confusingly similar design of the Samsung Ativ Smart PC. The Core i5 processor in the Samsung Ativ Smart PC Pro means this is a Windows 8 PC that could be your main PC. The dockable, hinged keyboard is a much more useful approach to giving you the portability of a tablet and the convenience of a notebook than the Acer Iconia W700 and its clunky dock. In fact, until Lenovo finally manages to ship the Helix (latest estimates say April), the Samsung Ativ Smart PC Pro is the only real competition for the Surface Pro. And its priced at £1,199 / US$1,199.99 / AU$1,399.